"The monetization of 4G data traffic has been critical for creating revenue uplift, even in the world’s most mature wireless markets like Finland and Japan, and remains a medium term priority for the industry." 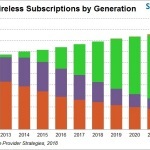 BOSTON--(BUSINESS WIRE)--There will be 9.0 billion user-linked subscriptions to wireless services by 2023, up from 7.7 billion today according to new forecasts from Strategy Analytics’ Service Provider Group. The new report, “Worldwide Cellular User Forecasts 2018-2023” predicts that 5G adoption will follow a comparable path to that seen by 4G LTE, but warns that there is limited growth left in connectivity revenue for service providers. Wireless service revenue will peak in 2021 at US$881 billion, just 3% above the level forecast for 2018. User-linked mobile 5G connections will grow from 5 million in 2019 to 577 million in 2023 (excluding fixed wireless applications and industrial IOT). These will account for 10% of connectivity revenue in 2023. Prior to the launch of 5G services, there is considerable time for 4G LTE platforms to evolve though LTE-Advanced and LTE-Advanced Pro technologies. Combined, these technologies will account for more than half of all 4G LTE connections by mid-2018 and hit 2 billion connections by year end. Even with 5G, many devices will still rely on 4G for roaming outside of 5G coverage areas.